PortalProdigy provides a standardized transaction engine that is shared by all of PortalProdigy’s feature components including shopping cart, administrative order entry, event registration, time billing, membership billing, exchange fees, etc. The benefit of this is that all of your transactions can be viewed, processed, managed, and reported on using a single set of tools. E.g. this means you have a single payment entry screen that allows you to apply a payment to a shopping cart order the same as you would for a class registration fee; you can also apply a single payment to multiple transactions regardless of transaction type; print sales and accounts receivable reports that include all transactions, use a single order management screen to view all of a customers orders including those for products, services, events, memberships, etc. Standardized transaction formatting and storage. Standardized order management for all sales and fees. Reprint orders for any type of transaction. Automated creation of journal entries for transactions. 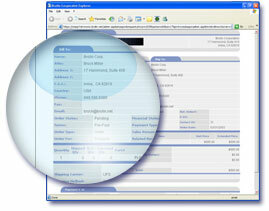 Export transactions to third party accounting systems such as QuickBooks. Apply credit memos to any type of order. Create refunds for credit memos and returns. Assign customers payment credit terms including maximum credit amount. Assign customers to price groups that can be used to provide discounts on products and services. Print transaction and accounting reports.